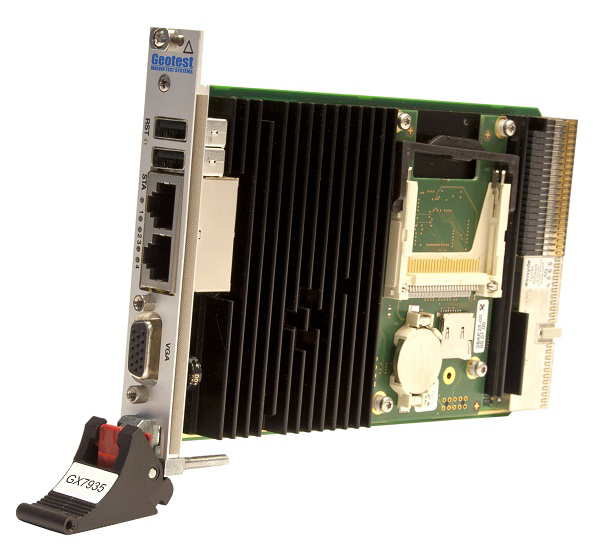 The GX7935 is a single-slot embedded cPCI 3U controller for use with Marvin Test Solutions' GX7300 PXI chassis. The GX7935 features a 2.26 GHz Core 2 Duo processor. When combined with the embedded storage peripherals of the GX7300 Series chassis, it is the ideal solution for an integrated, high performance PXI chassis / controller configuration. The GX7935 controller supports multiple peripherals and I/O interfaces through either the controller’s front panel or the rear I/O panel of the GX7300 Series chassis. Connection to the DVD-RW drive and hard drive is via the controller’s internal I/O interface. The controller’s front panel I/O is provided with a factory default configuration and is fully functional in any PXI or cPCI chassis. The GX7935 embedded system controller is compliant with the CompactPCI Core Specification PICMG 2.0 Rev. 3.0 and is compatible with the PXI-1 Rev. 2.2 specification.